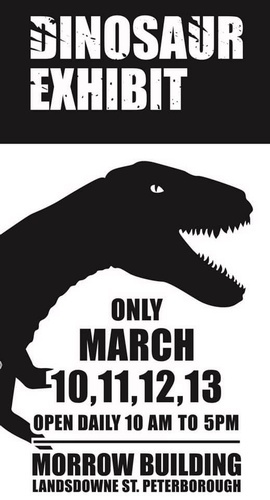 Join Indian River Reptile Zoo for their March Break Dinosaurs Exhibit! The exhibit is opening this Sunday, March 10th at the Morrow Building on Lansdowne Street in Peterborough and will run from 10am-5pm daily on March 10, 11, 12 and 13th. Stop by and see over 24 life sized, animatronic dinosaurs. They move & roar! This amazing exhibit is fun for children of all ages and a learning experience for adults as well. Admission is only $10 to see the dinosaurs. $10. $5 if you bring a drawing of your favourite dinosaur.